The Imperial Russian Air Service (Императорскiй военно-воздушный флотъ, literally Emperor's Military Air Fleet) was an air force founded in 1912 for Imperial Russia. The Air Service operated for 5 years. It only saw combat in World War I before being reorganized and renamed in 1917 following the creation of Soviet Russia. It formed what would later become the Soviet Air Forces. The origins of Russian aviation go back to theoretical projects of the 1880s by pioneer Russian scientists such as Nikolai Kibalchich and Alexander Mozhaysky. During the 1890s aviation innovation was further advanced by Konstantin Tsiolkovsky. In 1902-1903 during military maneuvers in the Kiev Military District, the Imperial Russian Army used several aerostats for reconnaissance and coordination of artillery fire. The Aeronautical company (Отдельная воздухоплавательная рота) was under the command of Colonel A.M. Kovanko. In 1904 Nikolai Zhukovsky established the world's first Aerodynamic Institute (Аэродинамический институт) in Kuchino near Moscow. One aeronautical battalion (учебный Восточно-Сибирский воздухоплавательный батальон) with 4 aerostats took part in the Russo-Japanese War. In 1908, the Russian Aeroclub (Всероссийский Аэроклуб) was established. In 1910, the Imperial Russian Army sent several officers to France for training as pilots. Later in the same year the Imperial Russian Army purchased a number of French and British aeroplanes and began training its first military pilots. 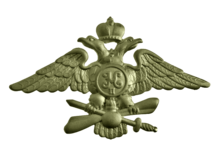 On 12 August 1912 the Imperial Russian Air Service, formerly part of the Engineer Corps, became a separate branch of the army. In 1913 Igor Sikorsky built the first four-engine biplane, the Russky Vityaz, and his famous bomber aircraft, the Ilya Muromets. In the same year Dmitry Grigorovich built several "M-type" flying boats for the Imperial Russian Navy. In 1914 Polish aviator Jan Nagórski conducted the first ever flights in the Arctic looking for the lost expedition of polar explorer Georgy Sedov. At the beginning of World War I, Russia's air service was second only to that of France (263 aeroplanes and 14 airships), although the bulk of its aircraft were too outdated to be of much use. Initially, Russia used aviation only for reconnaissance and coordination of artillery fire. Later, several aeroplanes were armed with steel flechettes to attack ground targets (columns of enemy infantry and cavalry, campsites, etc.). Later, aeroplanes were armed with air-dropped bombs. On 8 September 1914, the Russian pilot Pyotr Nesterov performed the first aerial ramming aircraft attack in the history of aviation Later, Lt. Vyacheslav Tkachov became the very first Russian pilot who shot down an enemy aircraft with a handgun. He attacked a German "Albatros" and shot the enemy pilot. In December 1914 a squadron of 10 Ilya Muromets bombers was formed and used against the German and Austro-Hungarian armies. On 31 March 1915 the Russian pilot Alexander Kazakov successfully performed the second ramming attack, using a Morane-Saulnier G as his piloted projectile. In 1915 the Imperial Russian Air Service became a separate branch of the army directly under the command of the Stavka (commander-in-chief's HQ). During World War I, 269 Russian aviators were awarded the St. George military decorations (St George Sword, Order of St. George or Cross of St. George), 5 aviators were awarded the Chevalier's National Order of the Legion of Honour, 2 aviators were awarded the Military Cross, 2 aviators were awarded the Order of the White Eagle and many others were awarded medals. 26 aviators became flying aces of Russian Empire. The most successful Russian flying ace and fighter pilot was Alexander Kazakov, who shot down 20 enemy aeroplanes. However, the war was not going well for Russia and following significant setbacks on the Eastern front, and the economic collapse in the rear, military aircraft production fell far behind Russia's rival Germany. The Imperial Russian Air Service aircraft hangars for seaplanes in Reval harbor, some of the first such structures to be made of reinforced concrete. After the February Revolution of 1917 the Imperial Russian Air Service was reformed. After the October Revolution of 1917 Russian Air Service was dissolved. more than 1300 aeroplanes became a basis of Workers' and Peasants' Air Fleet. More than two-thirds of these aeroplanes were foreign-made. 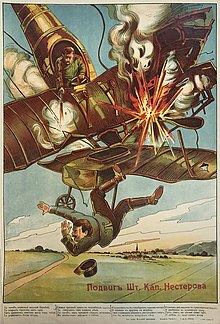 More than 50% of all aeroplanes were "Nieuports", more than 15% of all aeroplanes were "Farmans" and about 9% of all aeroplanes were "Voisins". Only 300-350 of these aeroplanes were used during Russian Civil War because of the lack of spare parts and maintenance problems. Kolchak's white army received 65 aeroplanes and about 70 pilots. Also, former members of Imperial Russian Air Service joined Denikin's white army. After the start of the North Russia Intervention several former pilots of Imperial Russian Air Service joined the white forces in North Russia. 219 pilots who fought in Red Army during Russian Civil War were awarded Order of the Red Banner (16 of them were awarded twice). Almost all of them were former pilots of IRAS. At the beginning of the war the basic Russian unit was the Otryad (or Squadron). 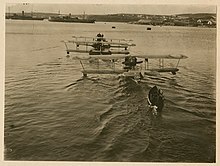 Originally, these consisted of only six aircraft, but this was soon increased to ten, with two machines held in reserve. These Otryads were put together into Groups of three or four and, like their German counterparts on the Western Front, moved to strategic points on the Front where and when they were needed. Even larger groups of aircraft called Istrebitelnyi Divisyon (fighter wings) were attached to each Field Army. In spite of Russia's need for airframes and engines, only about 5,600 aeroplanes were built in Russia before October 1917. Much of this was due to the fact that Russian industry could not keep pace with demand. Imperial Russia did not possess the manufacturing capacity to produce engines and airframes in the numbers needed. Thus, the Czarist government relied heavily on imported engines and airframes from France and Britain. Czarist Russia's aircraft production slightly outpaced her Austrian opponent, who stayed in the war one year longer, produced about 5,000 aircraft and 4,000 engines between 1914 and 1918. Of course, the output of Russia and Austria-Hungary pale in comparison to the 20,000 aircraft and 38,000 engines produced by Italy and the more than 45,000 aircraft produced in Germany. In addition to construction problems the Imperial Russian Air Service faced great difficulties in keeping the aircraft they did have in the air. Because it was so difficult to get new machines in a timely manner and because the Russians faced a shortage of aircraft for such a large front, the Russian high command kept out of date aircraft flying as long as possible. Thus, Russian pilots flew obsolete machines in combat throughout the war in the face of much better enemy aircraft. The fact that so many obsolescent machines remained in service produced Otryads that were an eclectic mix of aircraft; some front line, others nearly so, and some that should not have been flying. With so many different engines and airframes from French, British and Russian factories, trying to keep the machines flying was a constant challenge for Imperial ground crews. One report from the American War Department dated August 24, 1916 stated that, "The great majority of Russian machines are very dangerous to fly, due to the lack of proper over-hauling and having been tinkered with by inexperienced men. Lack of spare parts induced the Russians to fit magnetos and sparking systems to motors for which they were not built, and this makes the wear and tear excessive all around." 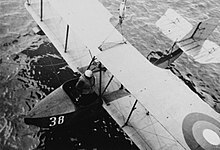 The Imperial Russian Air Service, in common with other World War I air services, struggled to find a way of allowing a machine gun to fire safely through the spinning propeller of an aeroplane. The Russian High Command was tardy in realizing the necessity for arming its aircraft throughout 1914 and 1915, leaving frustrated aviators using such impromptu armaments as pistols, rifles, trolled anchors and cables, and other makeshifts. Part of the delay was caused by a paucity of light automatic weapons that an aircraft could lift. However, it became apparent that the ability to aim both gun and aircraft simultaneously was a great advantage in aerial combat. In late 1915, Naval Lieutenant Victor Dybovsky of the 20th KAO invented a system of cam plates mounted on an engine's crankshaft that would prevent a machine gun from holing an aeroplane's propeller. Static tests at the Lux Aircraft Works proved its feasibility by November 1915; towards the end of the month, Morane-Saulnier G serial no. MS567 was forwarded to the 30th KAO for field testing. Poruchik Mikhail Shadsky flew test flights on both 9 and 29 December; cold thickened the machine gun's lubricant both times, preventing it from firing. When testing restarted in April 1916, Shadsky had more success. During April and May, he engaged the enemy about ten times. He shot down Austro-Hungarian aircraft on May 23 and 24 1916, but crashed to his death and his machine's destruction after the latter encounter. However, production of the interrupter gear was never carried out. Instead, Dybovsky was posted to England to inspect aircraft being constructed by the Royal Flying Corps. While in Britain he worked on a true synchronization gear with the British inventor Scarff; this became the "Scarff-Dibovski" system used by the British. Thus it was that by April 1917, Russian had only a couple of dozen fighter aircraft with synchronized guns. In the interim, praporshchik Victor Kulebakin was installing cam deflectors on another Morane-Saulnier's crankshaft. Testing in July 1917 showed that the deflectors did indeed pop out from under the aircraft's cowling to deflect any bullets that threatened the propeller. Although the modification was simple enough it could be fabricated in a unit's workshops, it was not widely used. ^ a b "12 августа 1912 года приказом по военному ведомству вопросы воздухоплавания и авиации были изъяты из ведения Главного инженерного управления и переданы специально созданному органу: в воздухоплавательную часть Генерального штаба. Эта дата считается днём образования военной авиации России"
^ "я вошёл в кабинет начальника штаба Киевского военного округа генерала Сухомлинова... Он встретил меня, кавалериста, приветливо, как собрата по оружию. - А вас тут уже давно поджидают с нетерпением, - сказал он. - Вы получаете на маневрах специальное назначение, к сожалению, не по вашей конной специальности. Дело в том, что мы испытываем впервые применение к военному делу воздушных шаров. Техника их удовлетворительна, но опыта наблюдений с них за за полем боя ещё нет. ...я нагнал воздухоплавательную роту на биваке... полковник Кованько встретил меня"
^ Михаил Жирохов. Болгарская авиация в Первой Балканской войне // "Уголок неба"
^ "Осенью 1913 года на заводе Щетинина построили первую летающую лодку инженера Д.П. Григоровича - М-1, затем М-2, М-3, М-4"
^ "Lennusadama renoveerimise mahukaim etapp sai valmis". Eesti Päevaleht. 4 November 2011. ^ "Свыше 2/3 самолётного парка составляли иностранные машины, преимущественно французские, в меньшем количестве английских, германских и американских марок. Свыше 50% парка приходилось на самолёты "Ньюпор"... свыше 15% всех самолётов занимали разведчики и бомбардировщики типа "Фарман"... около 9% парка составляли самолёты типа "Вуазен" различных модификаций... около 4% составляли устаревшие тихоходные машины марок "Моран" и "Блерио". Характерными особенностями самолётного парка являлась его разнотипность (свыше 30 образцов машин), техническое несовершенство и изношенность материальной части"
^ Christopher Chant, Austro-Hungarian Aces of World War I, Osprey Aircraft of the Aces, #46 (London: Osprey Publishing, 2002), pp. 17-18. ^ Alan Durkota, et al., The Imperial Russian Air Service: Famous Pilots & Aircraft of World War One (Mountain View, CA: Flying Machines Press, 1995), pp. 331-74. ^ Christopher Chant, Austro-Hungarian Aces of World War I, Osprey Aircraft of the Aces, #46 (London: Osprey Publishing, 2002), p. 16. ^ Alan Durkota, et at., The Imperial Russian Air Service: Famous Pilots & Aircraft of World War One (Mountain View, CA: Flying Machines Press, 1995), p. 7. ^ Quoted in Alan Durkota, et al., The Imperial Russian Air Service: Famous Pilots & Aircraft of World War One (Mountain View, CA: Flying Machines Press, 1995), p. 7 n. 5. ^ Kulikov 2013, pp. 8, 13-14. ^ a b c Kulikov 2013, pp. 13-14. Blume, August. The Russian Military Air Fleet in World War I, Volume One. (Schiffer Publishing, 2010). ISBN 0764333518, 978-0764333514. — The Russian Military Air Fleet in World War I, Volume Two. (Schiffer Publishing, 2010) ISBN 0764333526, 9780764333521. Chant, Christopher, Austro-Hungarian Aces of World War I, Osprey Aircraft of the Aces, #46 (London: Osprey Publishing, 2002)ISBN 1841763764, 978-1841763767. Durkota, Alan; Darcey, Thomas; Kulikov, Victor, The Imperial Russian Air Service: Famous Pilots & Aircraft of World War One (Mountain View, CA: Flying Machines Press, 1995)ISBN 0963711024, 9780963711021. Franks, Norman; Guest, Russell; Alegi, Gregory. Above the War Fronts: The British Two-seater Bomber Pilot and Observer Aces, the British Two-seater Fighter Observer Aces, and the Belgian, Italian, Austro-Hungarian and Russian Fighter Aces, 1914–1918: Volume 4 of Fighting Airmen of WWI Series: Volume 4 of Air Aces of WWI. Grub Street, 1997. ISBN 1-898697-56-6, ISBN 978-1-898697-56-5. Palmer, Scott W. Dictatorship of the Air: Aviation Culture and the Fate of Modern Russia. New York: Cambridge University Press, 2006. ISBN 0-521-85957-3. Н.Я. Комаров. Военная авиация и средства ПВО России в годы первой мировой войны // журнал «Вопросы истории». No. 4, 1974. П.Д. Дузь. История воздухоплавания и авиации в России (июль 1914 - октябрь 1917 г.) 3-е изд., доп. М., "Машиностроение", 1989. Отечественная история c древнейших времен до 1917 года. Энциклопедия (в 5 томах) / отв. ред. В.Л. Янин. Большая Российская Энциклопедия, 1994. С.П. Елисеев. Развитие авиации русской армии в Первой мировой войне // «Военно-исторический журнал», No. 2, 2008. This page was last edited on 5 January 2019, at 06:18 (UTC).